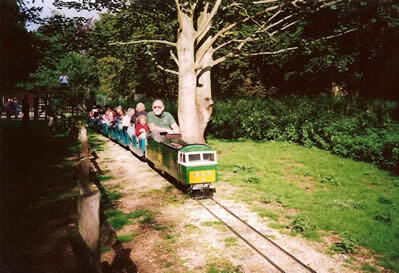 The Belton Light Railway runs through the woodland area of the National Trust property Belton House. Trains are operated by the push and pull method, trains running from the station next to a Childrens adventure playground, over a level crossing and through a tunnel to reach the end of the line. Trains then reverse back to the station. There is a footbridge and a two road engine shed at the station. The trains are run by two Mardyke diesel locomotives. Originally trains were steam worked and have been operated by other Mardyke locos. BLR Page was last updated on the 6th April 2013 with opening times updated.